Who let the cogs out ? Pun courtesy of a Bolter and Chainsword topic. Yeah, less than a year since the last post ! There is one problem with having fiddled with 3D printing and 3D design : it’s hard to refrain from customizing everything in your hobby. This is especially true when you see some good ideas in the design of miniatures but always think “brilliant, except this”. 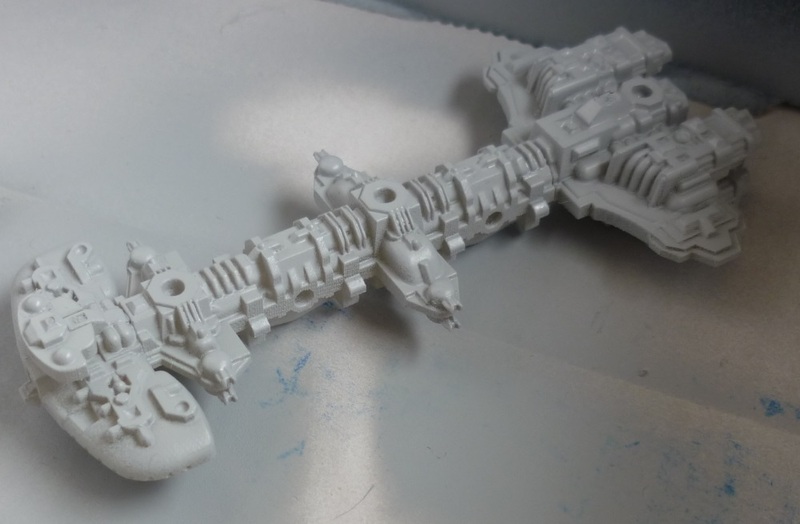 So in this post I’ll show the “this” in the case of my Adeptus Mechanicus army for 40K. And yes, the separation between Skitarii and Cult Mechanicus, while understandable in terms of marketing or even in game, is a bit too large for me. So as usual, since I’m such a fast painter and not a hobby butterfly, I’ll try to field a custom vision of the army. The detachment system of 40K allows this, the only issue is the point costs that add up quite rapidly. An Imperial Guard detachment, cheap and with some troops to represent the “regular” warriors of the forge worlds. It’s only my personnal view, but I envisionn them as more independant (human ?) that the cold description Skitarii had in their codex. More like troops not yet granted general augmentations to ascend to the Skitarii ranks. A Skitarii detachment, representing the elite troops, full of exotic tech and augmentation, more fanatized and with the beginning of a pseudo-gestalt mind, as described in the novels including AdMech these last years. Nothing special here, maybe some conversion for fun but the models are quite nice by themselves. A Cult Mechanicus detachment, representing the aristocracy of the group, with the Magos, his creations (Kataphrons), his prized technologies (robots) and allies (electro-priests). At the moment, it’s mainly the Cult Mechanicus faction that was both exhilarating and disappointing, model-wise. The Dominus is good but a bit too particular. The design studio of Games has tried to infuse the spirit of Blanche drawings in recent releases, but even if Tech priests don’t really care of human form and only look for improving themselves, I’ll have to convert one with a more anthropomorphic silhouette for the sake of having my own HQ. The Kataphrons were also a disappointment, but only because of the two variants being too similar to me. The differences are the weapons, and some additional plates on the torso and the tracks. The Kastelan are nice, but as a lot of people the goofy head, while nice for a Buck Rogers universe, don’t fit with our grim dark millenium. Also, the gun arms are a bit too simple to me, even if the whole streamlined effect of the model is OK with me. The datasmith is gorgeous though. 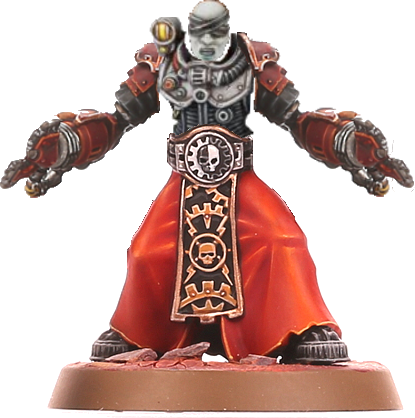 The models I’m more disappointed with are the electro priests, I don’t buy the techno-WFB-flagellants design, the tesla-steampunk gauntlets and collar of the corpuscarii. Just personal taste here. So, first work on this army (and this post) is the revamp of these details to make the army fit my vision. Here are my musing with the Cult Mechanicus part. 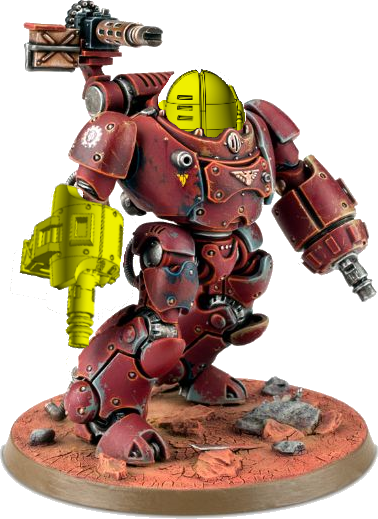 Kataphrons Destroyers : I really like the armoured look of the Kataphrons Breachers, with sturdy tracks and armour plates all over the mini and bulky weapons. 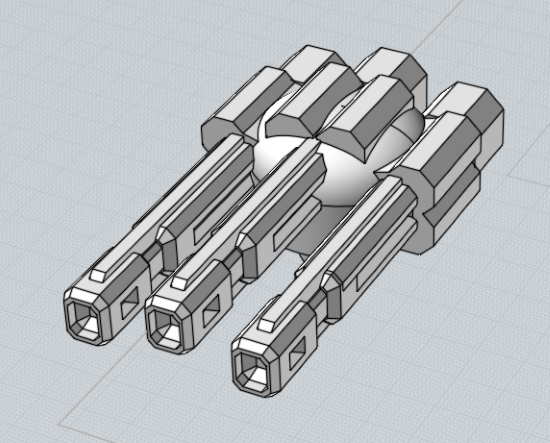 Therefore I wanted to make the destroyers more distinguishable. Since the latter are more weapon platforms than assault beasts. I went for legged servitors then, this hull allowing bracing, adjustment for firing big guns. 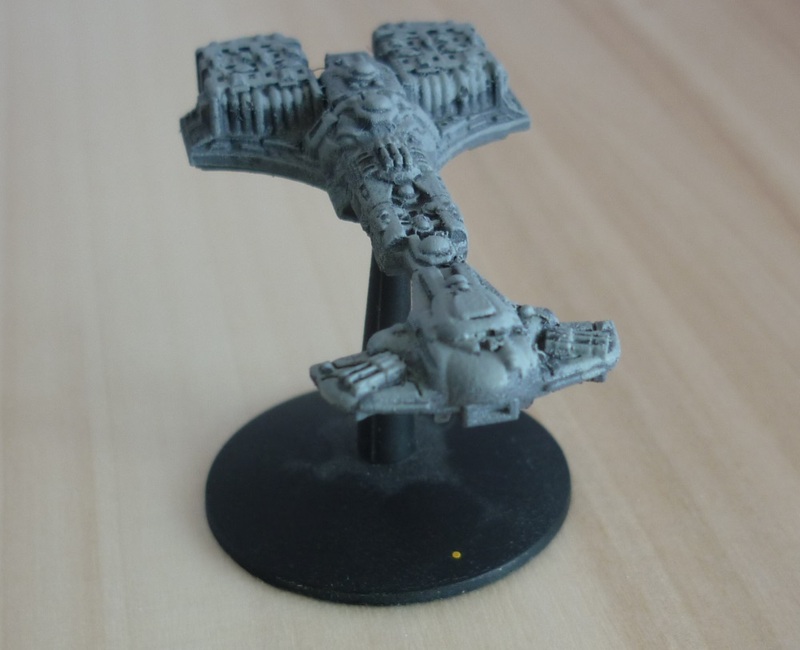 I did tie the look of the legs with the Onager to blend my conversion with the rest of the army. Not much work from there, the parts are ordered and shall arrive soon for a test fit and check the encumbrance and proportions of the thing. If fits, I’ll amend the design to allow some poseability of the legs. 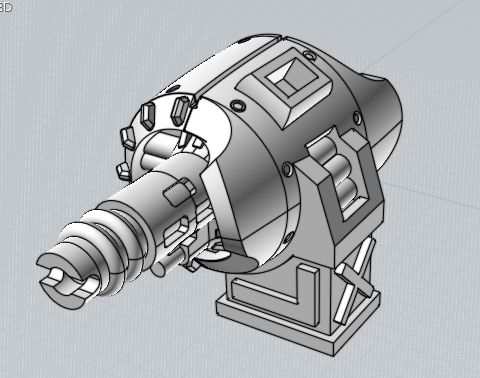 And maybe change the “shield” plate on the lower leg, I kinda rushed this part. Nothing fancy here, just simple mods and lines. Electro priests : The whole boys band flagellants design didn’t work for me. These guys are priests, not just crazed lowly manufactorum workers. Of course they are fanatical and all, but the term “priest” for the Admech always evokes me high or medium echelons. A priest is not an adept. 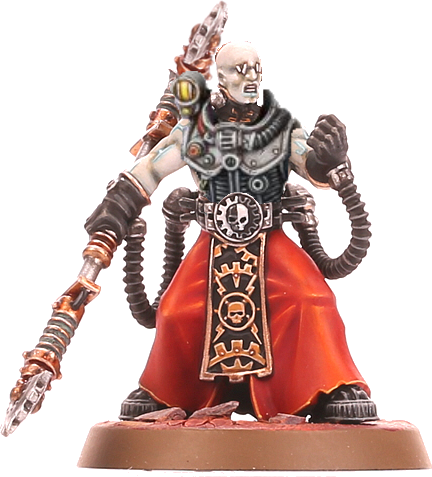 So, I’m thinking of using the genestealer neophytes torsos to replace the bare torso of the vanilla model. It looks rubbery (kinda works with the notion of electricity, isolation and such) and removes the flagellant picture. Concerning the Fulgurite, the bare arms holding the staff with gloves work for me to make them badass/close combat guys. And keeps with the idea of electoos and more fleshy look of these priests. Concerning the Corpuscarii, I’ll try another idea on top of just a torso swap. These are described as having the generosity of illuminating the galaxy. With lots of lightning bolts in your face, so that you understand the Motive Force. The notion of forcing a gift on people believing in something different does rings more radical to me, more fanatical than the fulgurite that I feel are more in the “you don’t deserve your electricity so we take it back” rhetoric. I had this idea of the corpuscarii looking for more change of their body to achieve their goals and thought of them ritualistically replace their arms with lightning projectors to wholly embrace their cause/be closer to the Omnimessiah/etc. I’m waiting for some parts to look if everything can fit correctly, because fast image montage can be misleading in proportions. So, that’s all for the moment, I’ll post picts when I have tested all these things. One briefing card for every game. Every faction recieved them and the players of that faction did choose its next game based on these fluff intel reports. Of course, sometimes the real scenario of the game is an ambush while you travel to obey your briefing … Of course, you don’t necessary know your enemy at this point :). To avoid the meatgrinder playstyle : every ship lost has a penalty on its Leadership the next round (-1 on ships, battleships dropped to 6). Some scenarios, if won, did give a token to cancel the penalty for ONE ship. A dynamic map, updated every round, to visualize where everyone was fighting. I’m rather proud of the miniships token I did for this event, but the map itself is absolutely gorgeous (Well done Pix !). A complete fluff book about the sector, 33 pages long as an introduction for the week end. The plot was about a Tyranid invasion in an imperial sector, with Tau evacuation fleet that flees before the beast and ends up in a cat and mouse chase with the local defenders and Eldars that just do their stuff with ancient Webway issues in the sector. All in all it was a very nice weekend, very smoothly operated and full of nice players and games. In the end the Piraleus sector did survive, despite having lost 2 sub-sectors to the Great Devourer. The Tau did stumbled on the last step of their exodus (only be lack of time :(). First : The Explorer. I wanted it more bulkier, since it’s a cargo/exploration vessel in the beginning, before being retrofitted for combat duties. It’s still WIP, being absurdtely undetailled on the bottom side, but it’s a 15 hours work to print it for the BFI tournament. I’ll keep it that way, just detailling some dorsal parts and allowing a proper keel. The prows and the engine section shouldn’t change. Explorer aft. I wanted to change the layout of it. Next : The Hero. The major change in the design was to alter the engines section. 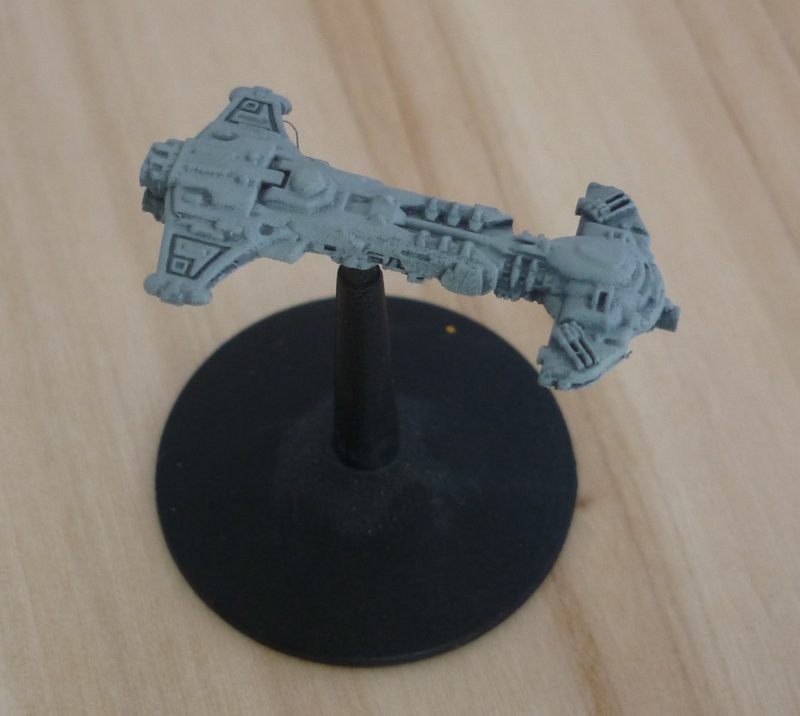 I understand why the engines on the original model look so puny (the Tau having difficulties matching other races miniaturization in space), but I wanted something else. As a huge fan of the design of the Star Wars Corellian Corvette (what an iconic ship), I mainly transposed it. The bulkier design fits for me for a race having troubling with space propulsion. We can be heroes ! The Merchant. Not much to say here, some detailling work, mainly concerning the engine section. 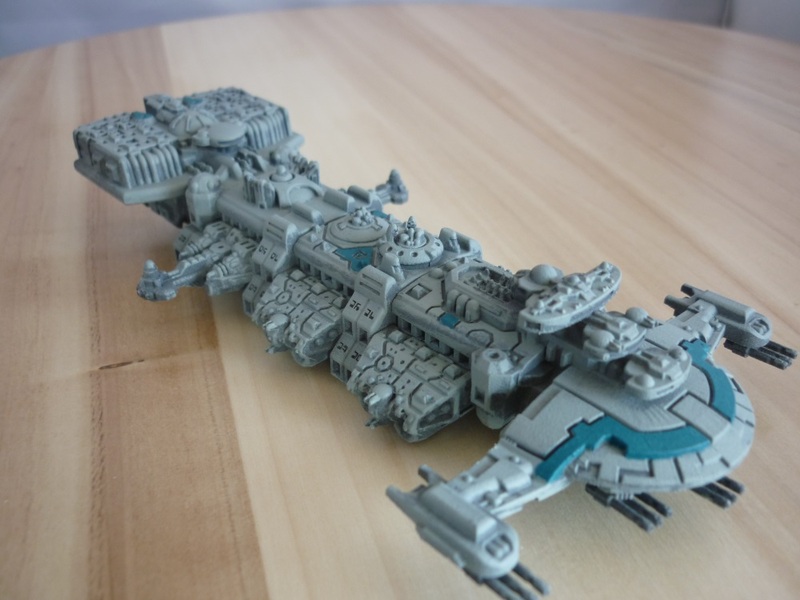 Yes, this is the tau vision of a “retrofitted transport”. It looks more impressive that it is. All the modules (launch decks, armaments, cargo or hook) are detachable and standardized. I have to take the plunge and test the magnetizing of the modules (I made a pre-hole on them and the hull to allow it. I only have to find a suitable magnet size able to hold them correctly). With this any configuration can be done, and I think, if it’s implemented properly, that it’ll allow to play with the variants class with a common hull. 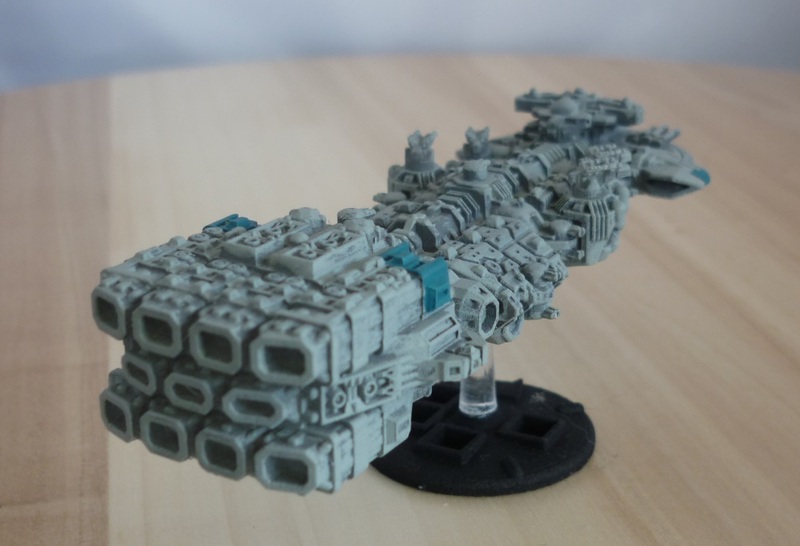 Orca : Just some proportions revisions, the “wings” on the prow of all the Tau escorts were always a bit larger to my taste so first revision here. It’s design to fit on the hooks module and the aft dorsal section of the explorer (just detach if from the base and plug it on). I shall add some picture of this. Defender : This one was depicted as large, and the original miniature was indeed larger. Same reasonning as with the Hero here : bulkier engines, looking like the explorer revamp. Messenger : A major change here, because it’s more a mobile comm station than a real ship. So it’s blistering with antennas and domes for intel equipment. And I personnally had a challenge the first time I had to see which was the Defender and which the Messenger with the original miniatures. Finally, a picture of the ordnances token, painting courtesy of Kurgan (so it’s nicely painted). 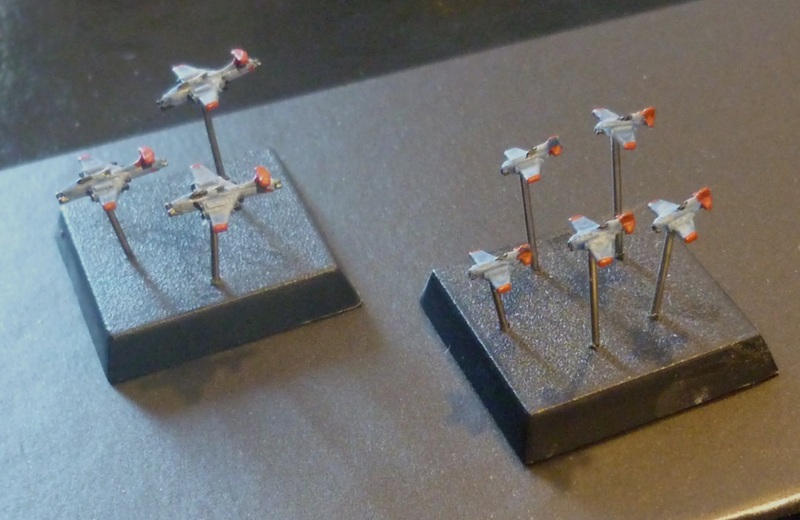 I chose to retain the Tigersharks as bombers … well just because I like their look :). Back again on the Imperium. 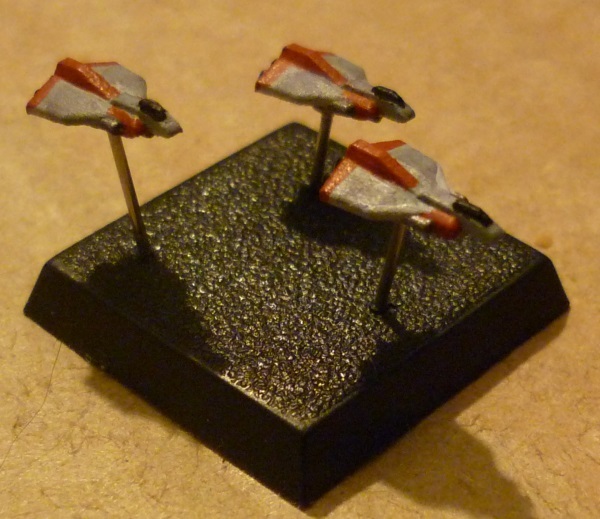 With the coming of BFI (french BFG tournament), I’m keeping on building a fleet with the 2010 Bakka list. As of now, I have several conversion on the standard cruiser to reflect the orthodoxy of Bakka (keeping a Mars Pattern) with enough small changes that make the fleet recognizable. The 2010 list adds some very interesting variants. 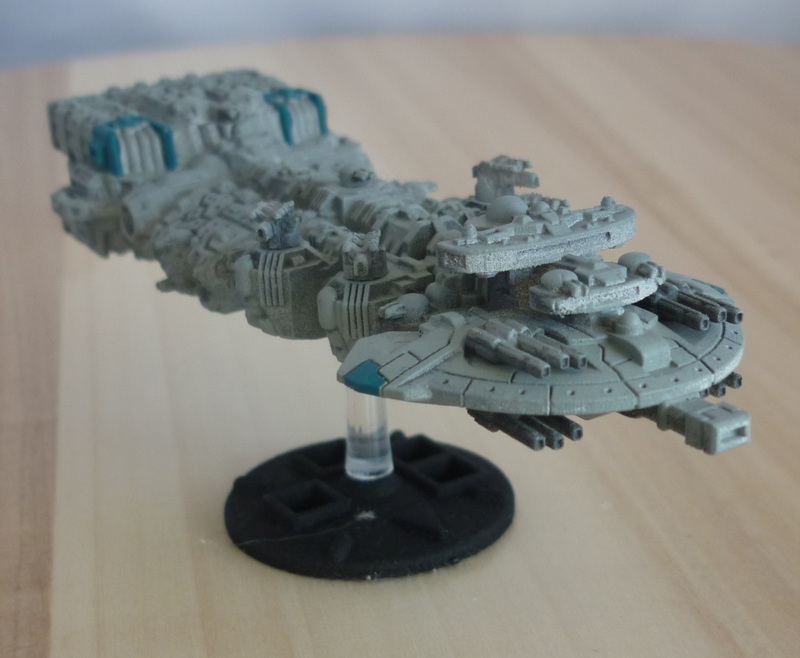 I had worked previously on the Havoc frigate for Cypra-Mundi, with the diamond prow, but with only a prow swap if can be made quite good looking (yes, I sometimes praise myself). I’m planning to field some in June for the tournament. Now time to find my ordnance for Bakka … They’ll have to be bulky, because Bakka is old school and I see them heavier than the standard Mars pattern. Well, for french BFG players it should not be a surprise as now, but I’d like to drop a few lines on the coming BFI tournament of this year. BFI was an initiative of some parisian players to finally try to hold a regular event arround BFG. It holds in june in Paris at a shop named the Waaagh Tavern (awesome people there in the staff, don’t hesitate to drop by if you are in Paris and innocently want to link with the hobby). Last year was the first edition, and a rather classic tournament in the mechanics, but with a lot of good spirit from the players and the staff. Nicely painted tables were available, which is always best. It’s also a full painted tournament, because grim dark gothic space miniatures always look better when painted. Unfortunately, the event last year was a bit altered for me, as my son was quite ill both before and during the tournament, so I had to frequently do round trips during the event, which wasn’t the best. 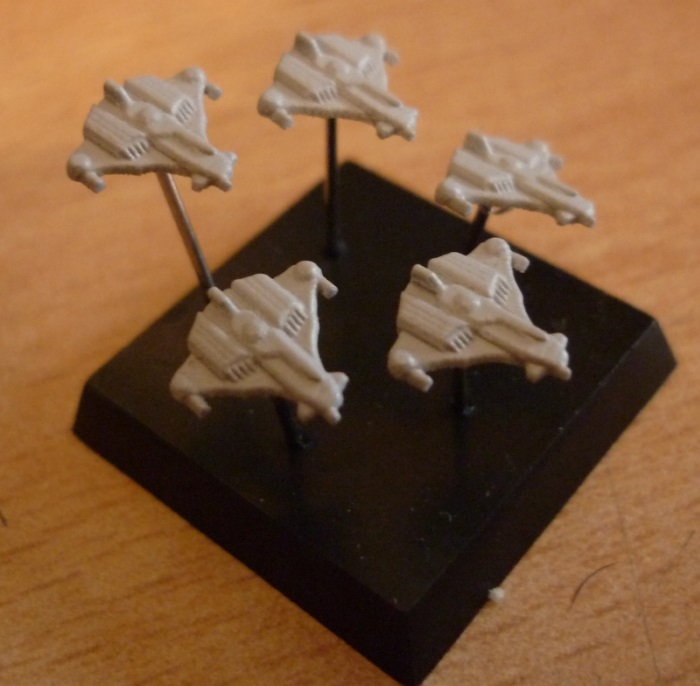 And as I was a bit overwhelmed, I even didn’t manage to paint my fleet :(. This year, I was able to be more invested in the preparation of the event, and the main change is that it’s more a large scale narrative campaign (4 turns – 20 players) than a competition. It’s already hard to play on a regular basis BFG, at least the BFI aims to make people play together instead of against each other. Basically, the background story revolves arround the Tyranid invasion of a sector, but we try to find some hooks to change a bit from a too classical story. This year again, I’ll play a Bakka fleet. The 2010 list is OK (a few things aren’t to my liking, but enough of it so I can build a list). And of course I didn’t resist to make some custom models to fit with my vision of Bakka (and the conversion I have already done). More on this in a few days. I can’t tell you much right now, as we prepare some suprises, but I wanted to show that BFG is still alive (and yes “this was a triumph”) in France. I’ll give you some feedback and pictures of my fleet in the two months to come, and of the event in june :). Again, let’s relaunch the blog :). This time a centralization of a project which began with the last Tau codex at 40000. 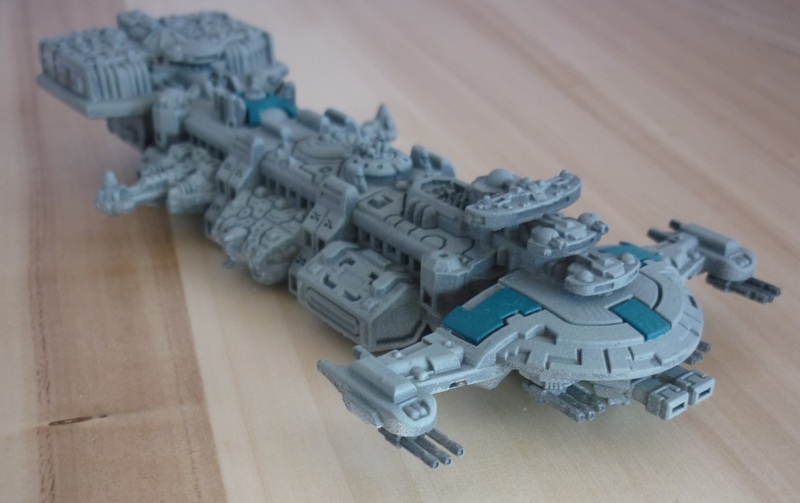 When the Kor’vattra was released for Battlefleet Gothic, I reacted like almost everyone : “Woh, it’s ugly”. 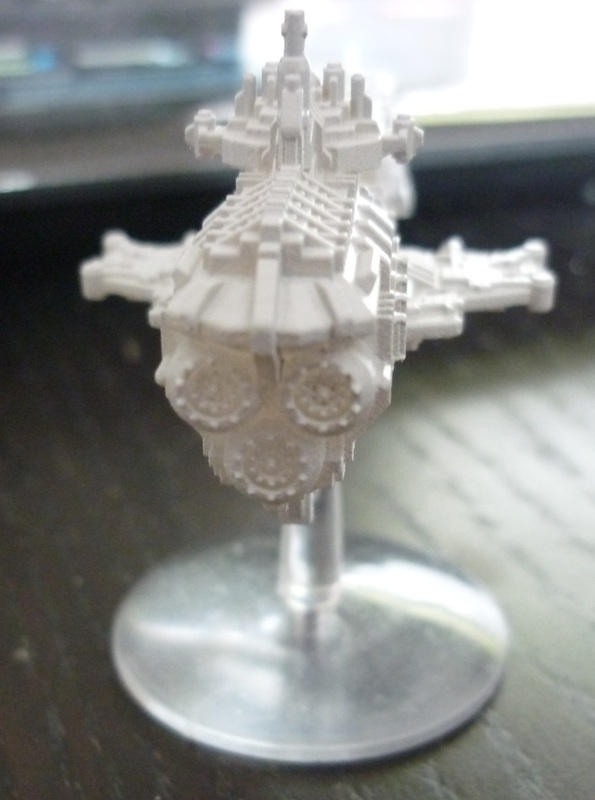 With time, I began to appreciate the retro design of the ships, as it fits the low tech in space for the Tau. But (there is always a but) the miniatures were crude and the fact that they were made of metal didn’t help for the details and assembly gaps. 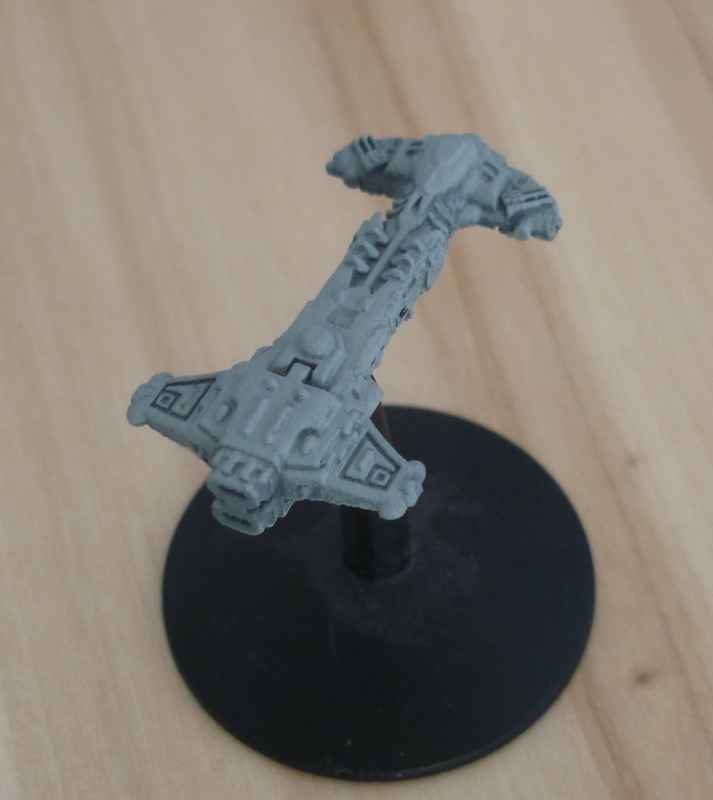 So, in parallel of my return to the Tau in 28 mm, I began working on HD models for the Kor’vattra. No major changes in the designs, I just tried to densify the details. 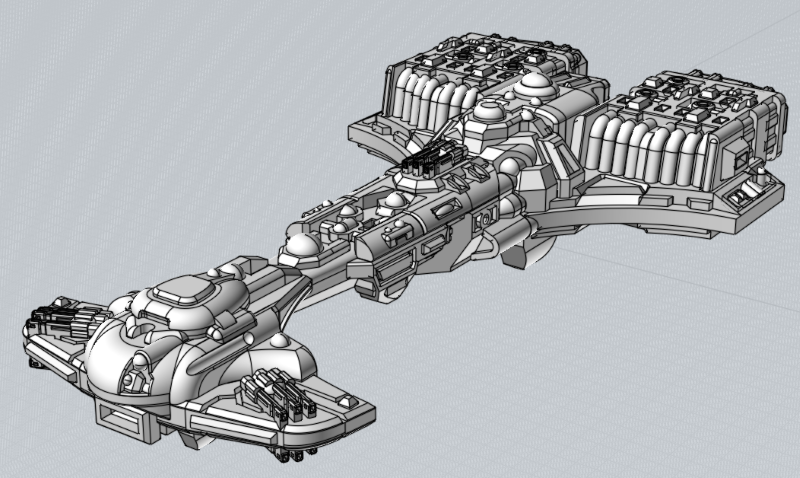 First work on the Merchant (also to be able to have heavy transports for the Kor’vattra hence the need for a Cargo Module to be designed). 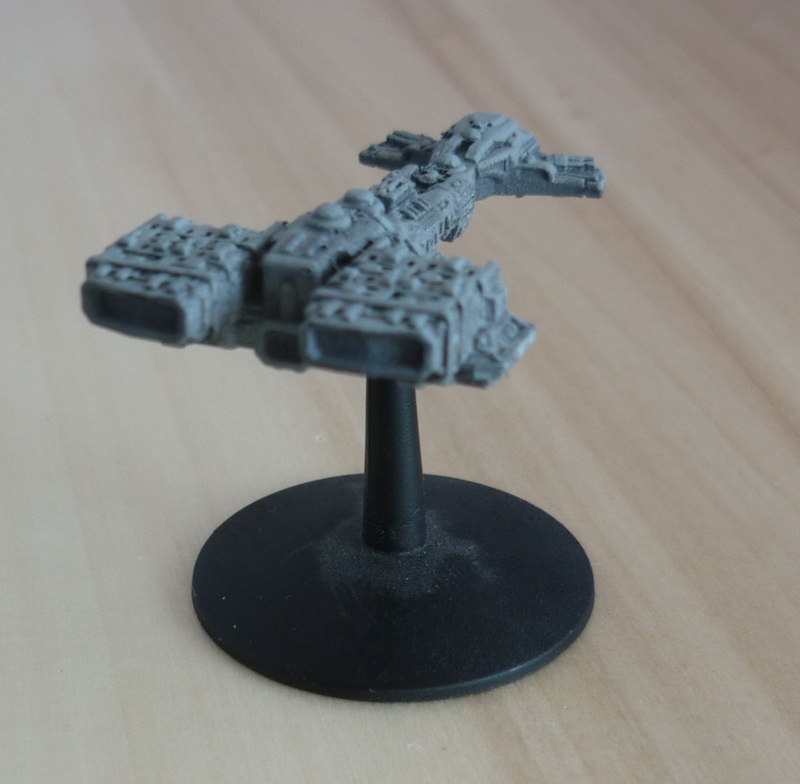 The prototype from Shapeways has arrived and has been primed (badly as I’m unable to make a smooth undercoat). For the cargo module, I tried to be coherent with a small freighter I made some time ago (which looks so dull and undetailled now). 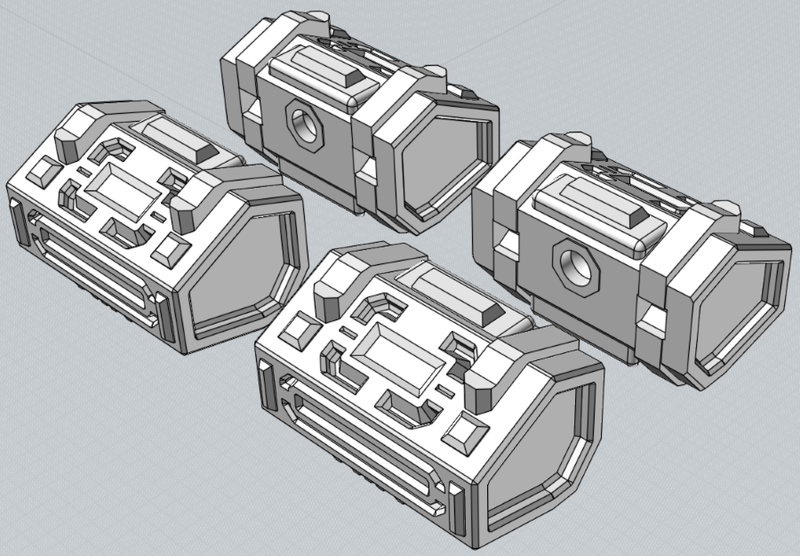 Some changes too on the gun module, allowing placement of turrets to show the fire arcs (front + side). The launch decks are made, I’ll show them with the Hero. 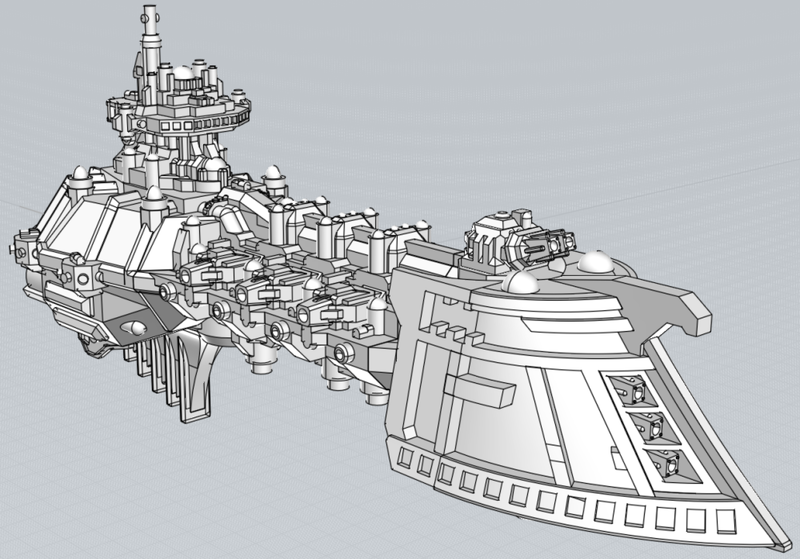 Work done on the Orca and the Defender (some details left to be done at this stage). Design picture at this time. 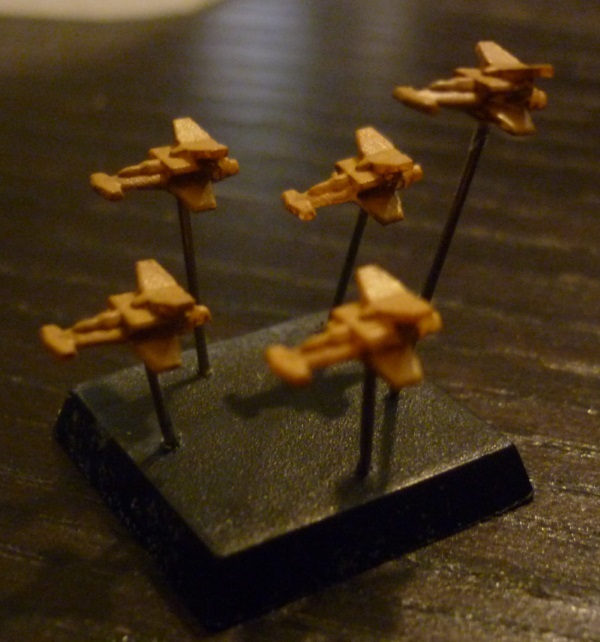 And to go with, some fighters and bombers. So much for a regular update on the blog … This whole year saw the eking out a living (is this english ?) of several projects, but mainly a lot of change in my personnal life (work, home, familly …). First line of work, some little ordnance minis to replace the regular ordnance tokens. I tried to have several designs, because a bit of variety is always welcomed. First of all, a set of fighters/bombers inspired by WW2 airplane (which make them suitable to figure marauders or thunderbolts). With this kind of volume it’s a lot cheaper to print them directly en masse than casting them in resin, so I have a horde of them ^^. More classical but I think it suits the bulky and ragged look we all love. 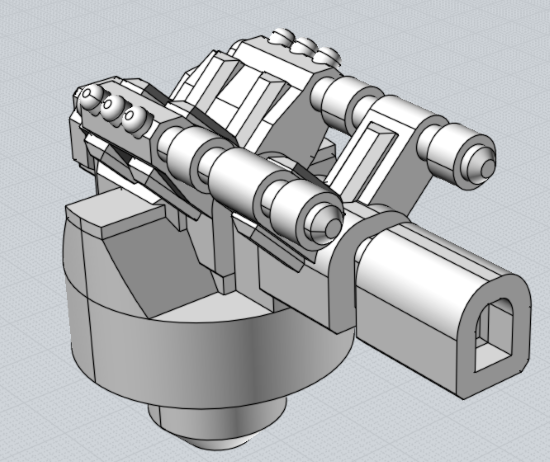 Nicknamed “Dragonfly” by several people in place of the “Banshee” original name, but well … I’m quite proud of my work (yes, more self-praise) for a 8 mm piece. 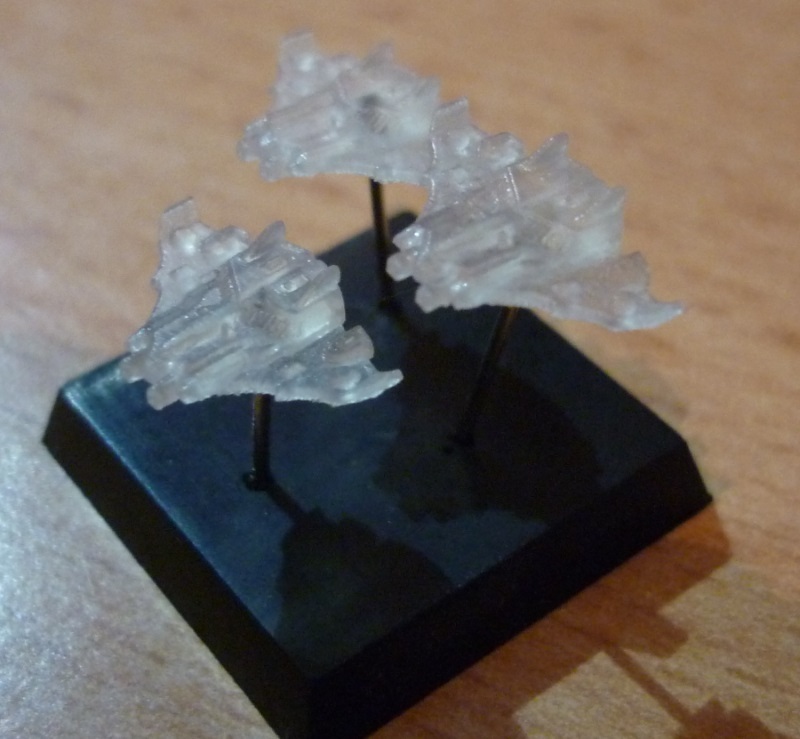 Just the basecoat ATM, thay’ll reinforce my Voss fleet. 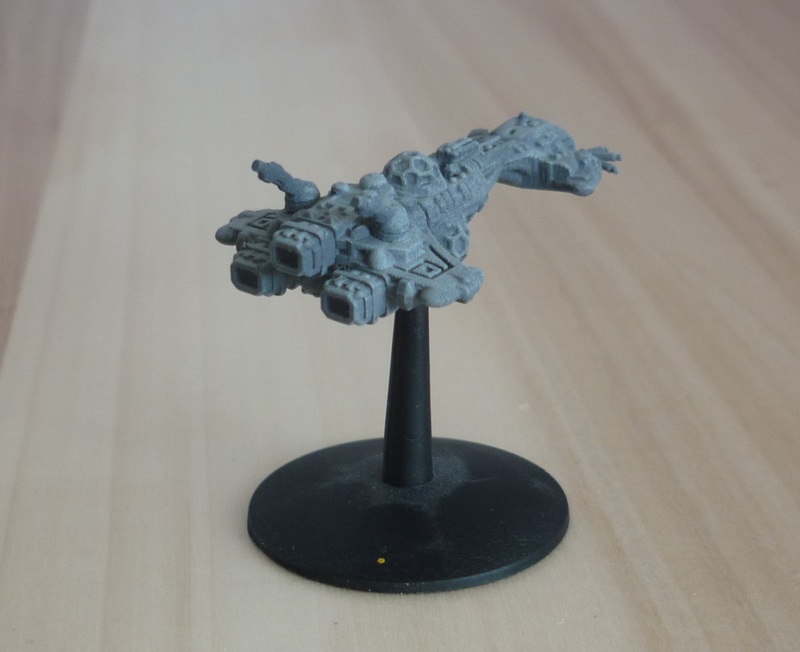 On this lame japanish pun, I’m quite proud to announce that I finally finished my model for my Firedaggers, for the Bakka battlefleet. 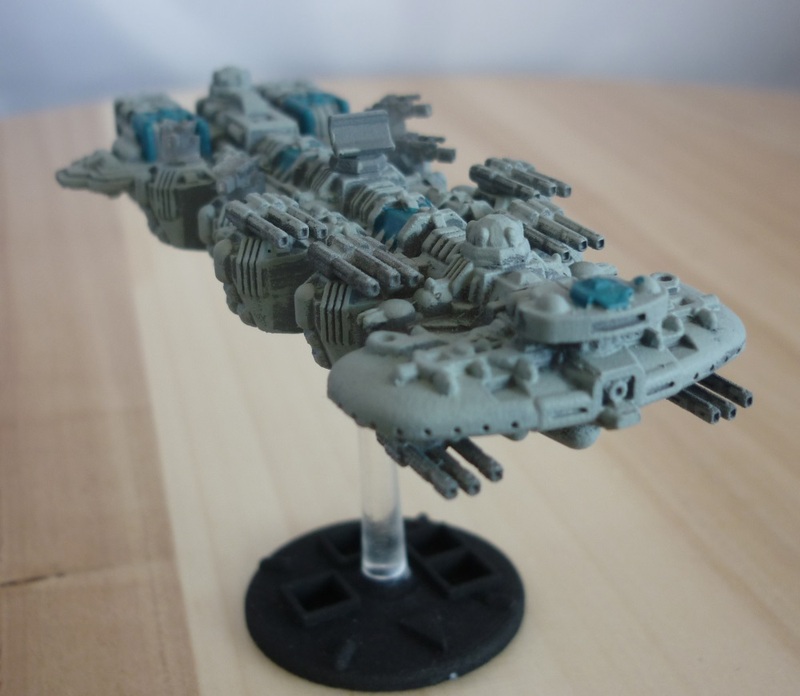 This fleet comes from an alternative imperial fleet, in the venerable BFG Magazine #2, and represents the home fleet of Segmentum Tempestus. The list was updated in 2012 by the BFG Compendium team. I’m not a big fan on some modifications they made, but some are interesting. There is some people that question the choice of Bakka for this expansion, but personnally I like its fluff and the orientation is interesting. The compendium version make the list more playable, but some new ships like the Havoc aren’t to my taste. 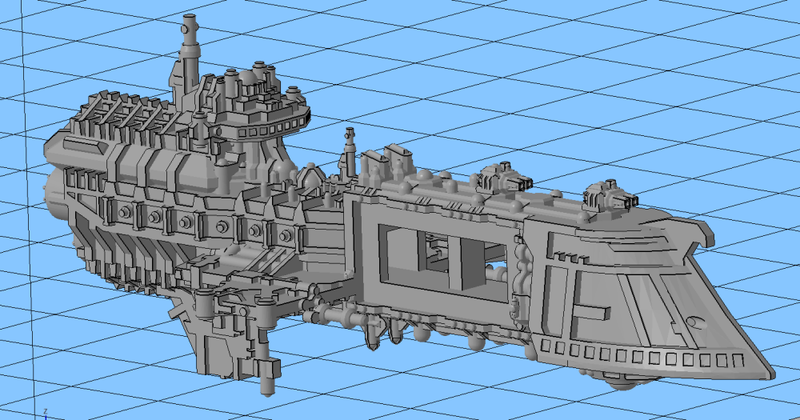 On the contrary, the Mercury really fits the concepts of this fleet, very gun-oriented. So, first work on this : The Firedagger. Bakka is a fleet belonging the Big Gun Lobby in the admiralty. Thus, they use very few attack crafts. This dates back to the 36th millenium, when the Gaerox Prerogative tried to focus the new doctrine of Bakka on carriers. Lamely, some ships (like the Despoiler) all defected to Chaos, or were too ammunition consuming (like the Viper destroyer). The Firedagger is a frigate hull equiped with Fleet Defense Turrets, capable of defending nearby ships from ordnance attacks. 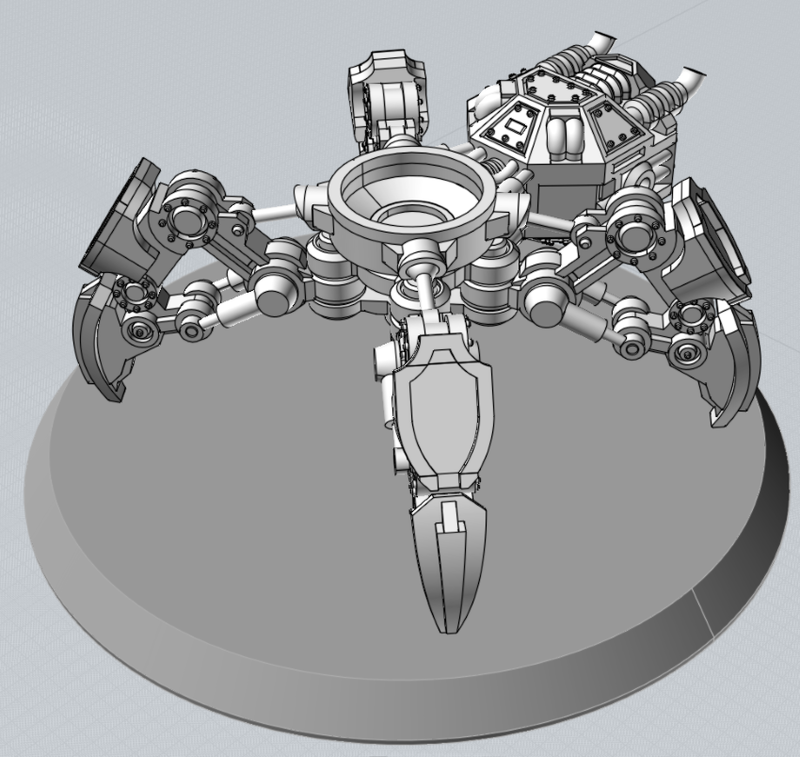 These turrets are also available to some of the Mechanicus cruisers. 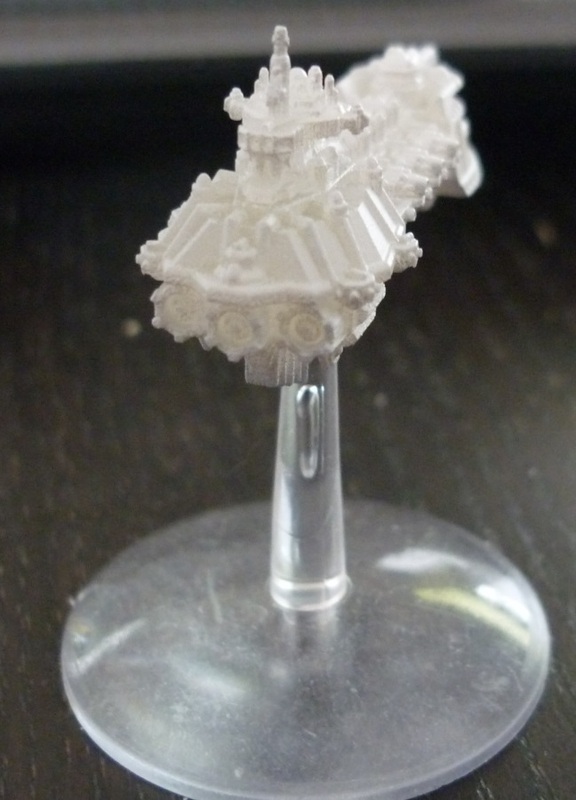 The Flak turrets are separate, allowing some posing and re-using on Mechanicus ships. The second work for Bakka is my Daemon Slayer. 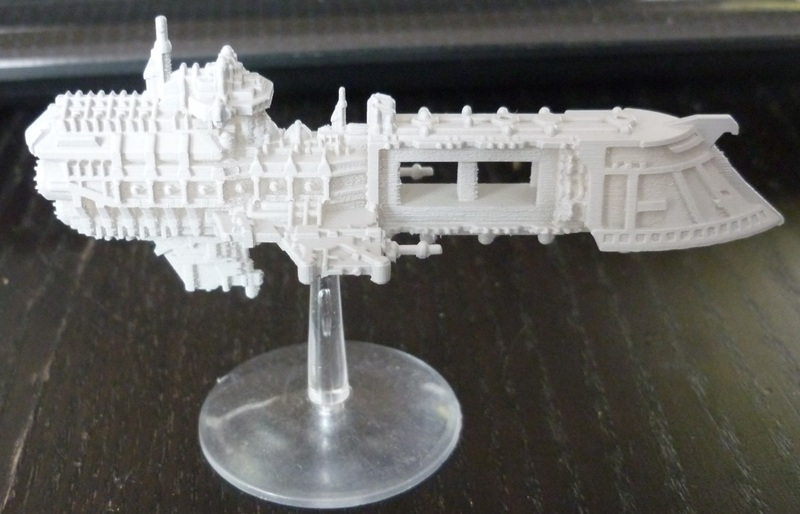 This ship comes from the BFG Mag #2 too. 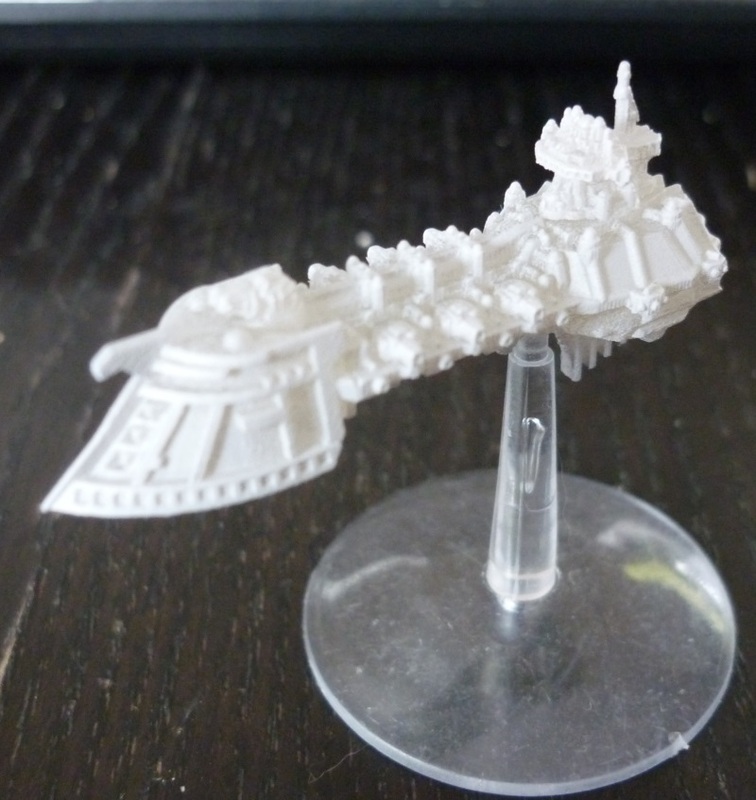 It’s a unique ship (basically a Tyrant), armed with a prow psychic canon. 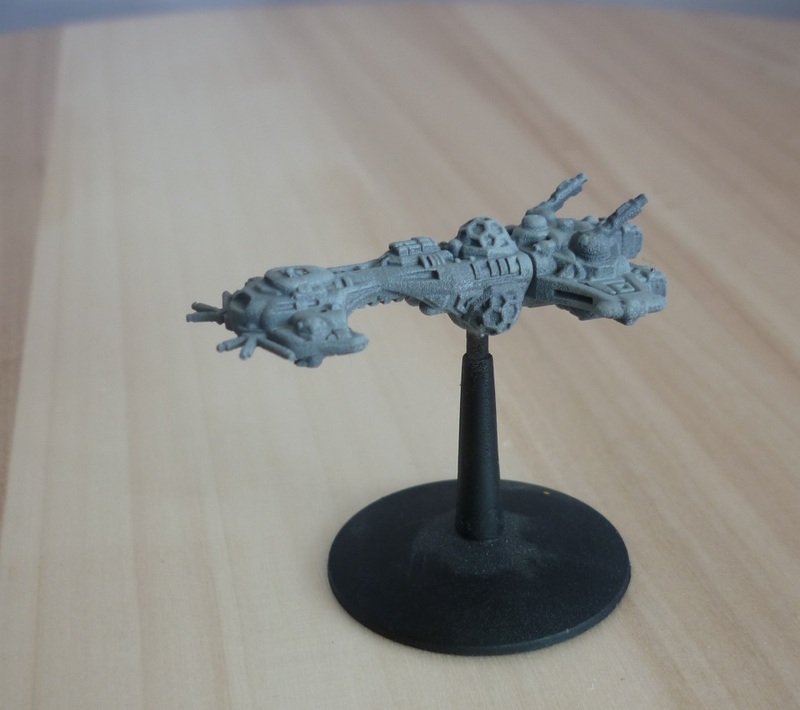 This is an abomination which disrupts the hive mind control for tyranids, banishes demon ships and cripples a regular ship for a while … As it’s a unique ship, I tried to make it stnd out, while staying in the general design of an imperial cruiser, since Bakka is a rather rigid fleet on the conception of ships. These are the firsts layer of paint, to settle the official paint scheme of Bakka. – A bridge from a Mechanicus Cruiser in place of the antennas, to represent the esoteric face of the psychic canon (containing a psyker choir or similar), and reinforcing the relic side of the Daemon Slayer. 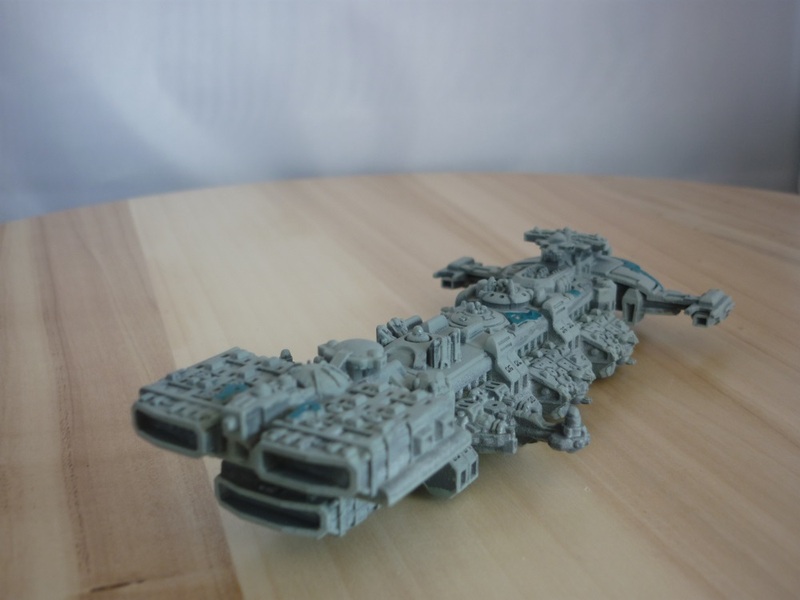 – A custom made engine (made for my Cypra Mundi fleet, before I found a better piece for it. More in a post to come). – The wings were lengthened with the fins of the Repulsive bridge. Well, this is only the beginning :).